It’s more than having a bad day or feeling down. Depression is a serious mental disorder that affects over 300 million people across the world, and 16 million adults in the United States alone. That makes up roughly 6.7% of the adult population in the country. Depression can take a toll on your body and your brain, lead you to feel exhausted, cause loss of motivation, and can definitely have an impact on your skin. 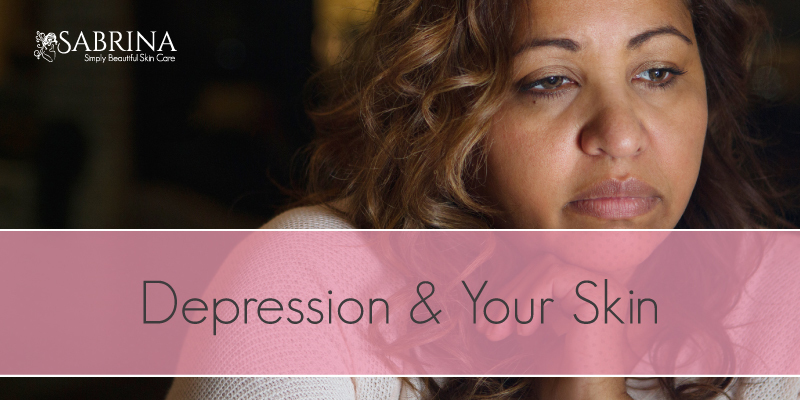 Suffering from depression and your skin issues can lead to more negative emotions, so it’s important to understand how depression can affect your skin health as well as your mental and physical health. Depression can lead to stress and vice versa. The more you are stressed, the more you may notice signs of aging and wrinkles popping up on your skin. This is due to the cortisol hormone, also known as the “stress hormone” which flows through your body during times of stress, and can often show on your skin. Excess levels of cortisol in your bloodstream can cause Cushing syndrome, a condition that can lead to weight gain, high blood pressure, and multiple changes in the skin, such as redness in the face. Stress can also lead to junk food, sugary beverages, and alcohol being more appealing when you need a pick-me-up or a reward for a bad day. All three of these, plus a lack of water, can lead to dehydrated skin, which can show up on your skin in the form of dry patches, general dullness, or even acne. Be sure to speak with your doctor for more information on reducing stress, and how to prevent signs of it from showing up on your skin. Stress and depression can leave you feeling more exhausted. Even if you are getting the recommended eight hours of sleep per night, a combination of these can still make you feel exhausted. On the other hand, depression paired with stress can also cause sleepless nights, which can really show on your skin when you wake up each morning. Dark circles, bags or puffiness under the eyes, fine lines, and a general dull appearance to the skin are some of the more noticeable signs of sleep deprivation and can often be difficult to conceal, especially if you find them occurring on your skin more frequently. While you’re sleeping, your skin is working hard to produce collagen and refresh itself to prepare for a new day. If you are tossing and turning or getting up throughout the night, this process is interrupted. This can lead to the aging process progressing faster, your skin losing thickness and elasticity, and a dull appearance to the skin. 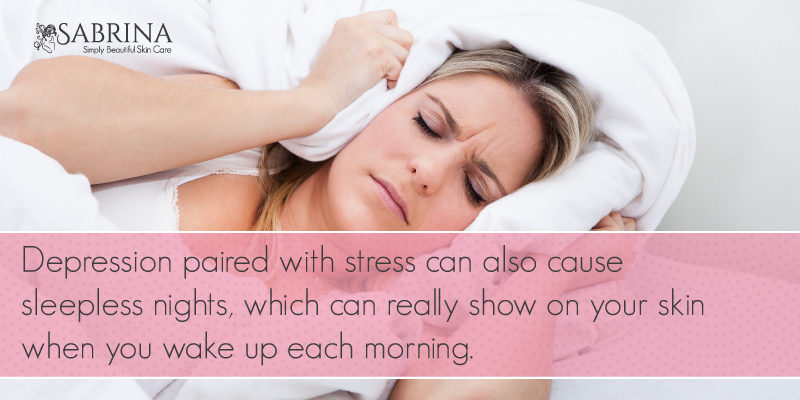 For more information on sleep and your skin, contact your doctor for their recommendations for you. Whether it’s getting more sleep, using the right nighttime and morning skin products, or other methods, a medical professional can give you the right advice. 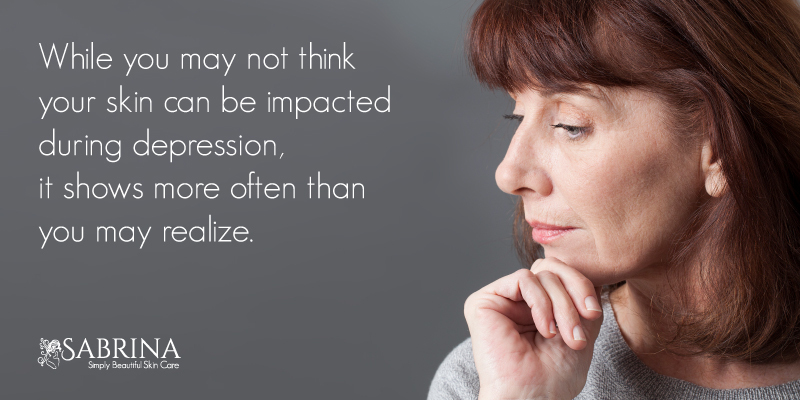 Depression may cause you to stop following a routine or forget to do daily tasks. Some of these daily tasks can include the steps in your skin care routine. Forgetting steps like washing your face, applying moisturizer, or skipping out on sunscreen can have negative effects on your skin. Skipping steps can lead to dry skin, premature signs of aging, dullness, acne, and more. Some of these noticeable changes on your skin can often cause you to lose more confidence in yourself, which is never good for depression. It can be challenging to find motivation to do much of anything during bouts of depression, so don’t beat yourself up if you aren’t up for the task. Get back to your routine little by little, speak with your doctor about your depression, and consult a dermatologist for more information on getting your skin back on track. Depression impacts everyone differently, especially with millions of people suffering from some form of depression worldwide. While you may not think your skin can be impacted during depression, it shows more often than you may realize, which is why it is essential to keep tabs on changes in your skin, as well as other changes that occur to your body. Bring these signs and changes to your doctor in order to receive proper treatment for depression. If one of the noticeable signs of depression is premature aging, or you are fed up with your wrinkles and fine lines in general, there may be a solution for you. If you aren’t getting enough rest each night, your collagen production has slowed down, or you want a solution for dull, aging skin, the SABRINA Collagen Rx Plus Anti-Aging Face Cream may be for you. For best results, exfoliate before you begin using SABRINA Collagen Rx Plus and continue to exfoliate once a week. Exfoliation removes dead skin cells and allows the new cells below to fully absorb which generates faster results.Massage the cream into your face, neck, and chest in the morning and before bedtime to achieve softer skin and to see fine lines, pores, and wrinkles diminished.